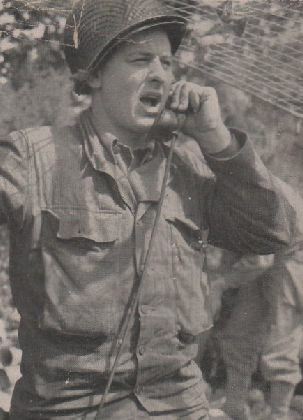 The 9th Infantry Division radioman had to know all the call signs. 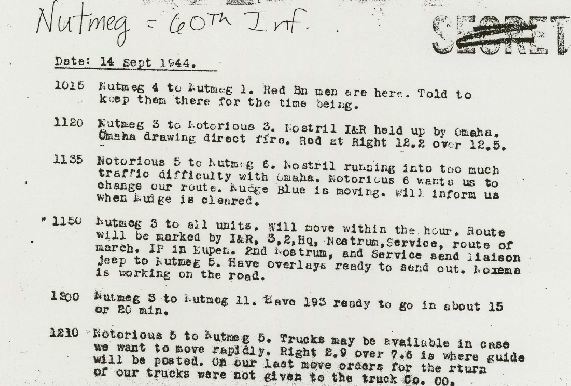 In wartime, communications between Divisions, Battalions and Companies had to be done by using so called “Call Signs”. This was a “code” word for each group to protect any form of information that might fall into the hands of the enemy. These call signs can often be found in radio conversations and reports. During World War 2, the first letter of a Division would usually be the first letter of the call sign name. The code name assigned by the US Army to the 9th Infantry Division was “Notorious“. All components of the Ninth Division were given code names that started with the letter “N”. After doing some research, I was able to find several of the call signs that were used by the 9th Infantry Division. In some of the radio reports we can see how these call signs are being used. Some of them are actually pretty funny to read. This translates to being the 1st Platoon Leader of Company A, part of 1st Battalion, 60th Infantry Regiment. Commander of 3rd Battalion of the 39th Infantry Regiment. Special thanks to Jay Weinstein, Claude Berghorn, Frederic Blais and Jeff Haines. Nuptial Call Sign – 60th Field Artillery Battalion (behind the pole on the left). Notorious (9th Infantry Division) Sign for its Forward Command Post. Another “Notorious” (9th Infantry Division) sign in Normandy, June 1944. Nutmeg (60th Infantry Regiment) General Routine Order (G.R.O.) sign in Langerwehe, Germany. Please contact me for any additions or corrections to this page.